Blackhawk Diversion Carry Workout Pack FREE SHIPPING! Carry weapons discreetly and comfortable with the Blackhawk! Diversion Carry Workout Pack. 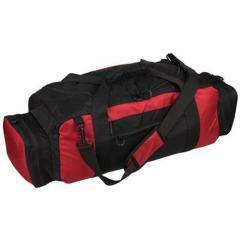 Designed to look like an ordinary workout bag, this discreet weapon pack offers covert and tactical firearm transport. The duffle bag style is constructed from 420 velocity nylon, offering a durable shell while maintaining maximum discretion. End pockets feature collapsible interior panels, allowing the main compartment to be extended to fit longer items as well as provide speedy weapon access. A removable compartment divider offers side-by-side or upper/lower pocket division for carrying multiple weapons. Internal loop lining offers secure attachment of additional hook-backed holsters and accessories. ©2002-2019 CopsPlus.com: Blackhawk Diversion Carry Workout Pack FREE SHIPPING!